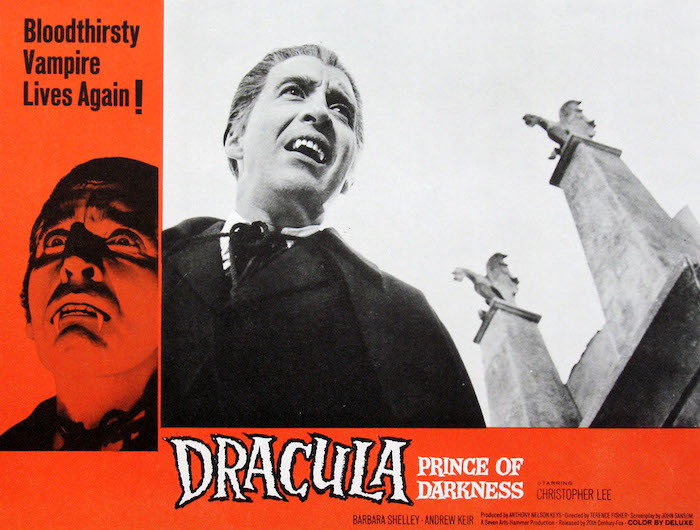 Blu-Ray Review: Dracula – Prince Of Darkness (1966). Hammer Films’ approach to sequels has always fascinated me. It was smart, it was different. 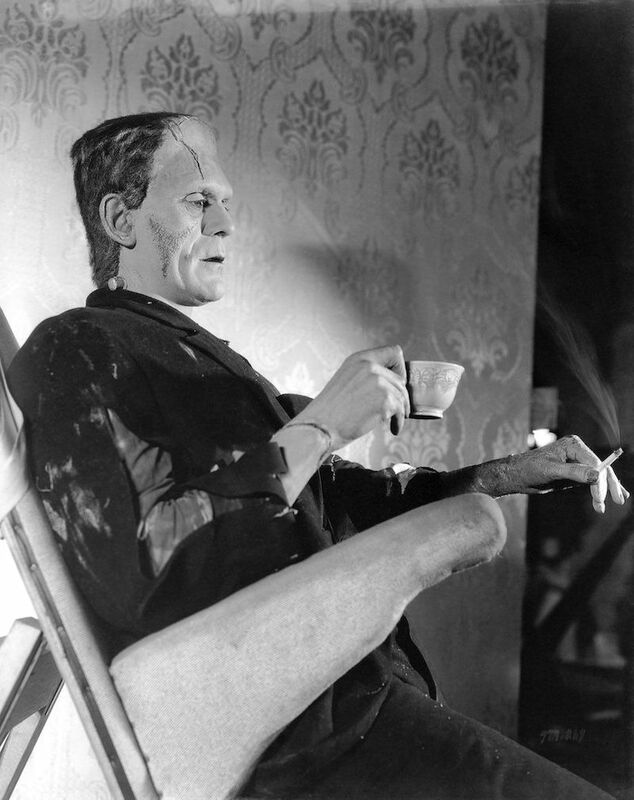 Their Frankenstein pictures followed the doctor, not the monster. Each film saw the good doctor hiding out someplace new, working on his latest experiment. Brides Of Dracula (1960), Hammer’s followup to their Dracula (1958, known in the US as Horror Of Dracula), went in the same direction. 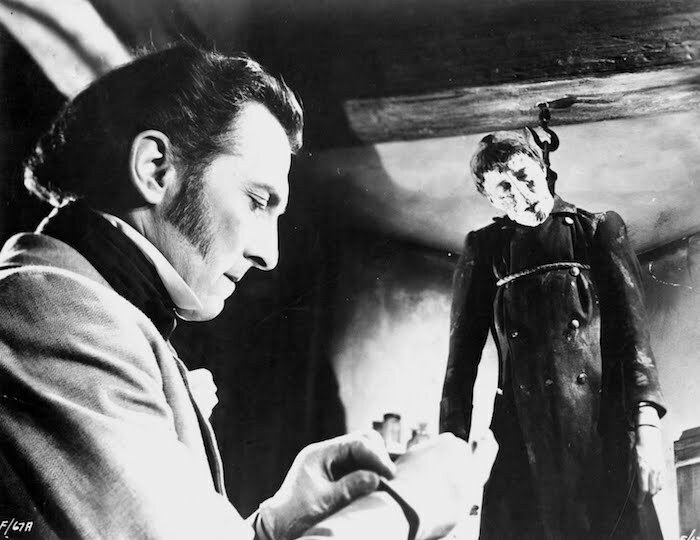 Since Count Dracula had been reduced to a nasty pile of dust, they kept their focus on Dr. Van Helsing (Peter Cushing). Makes sense. But I guess a Dracula movie isn’t a Dracula movie if Dracula’s not in it. 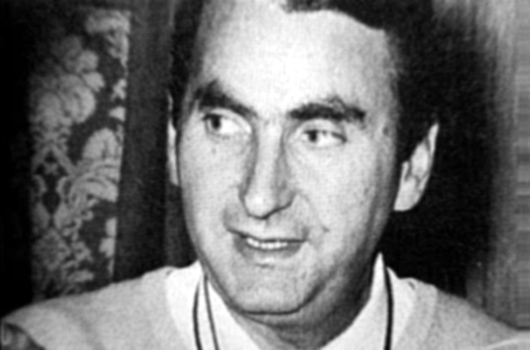 So Hammer worked to bring Christopher Lee back. 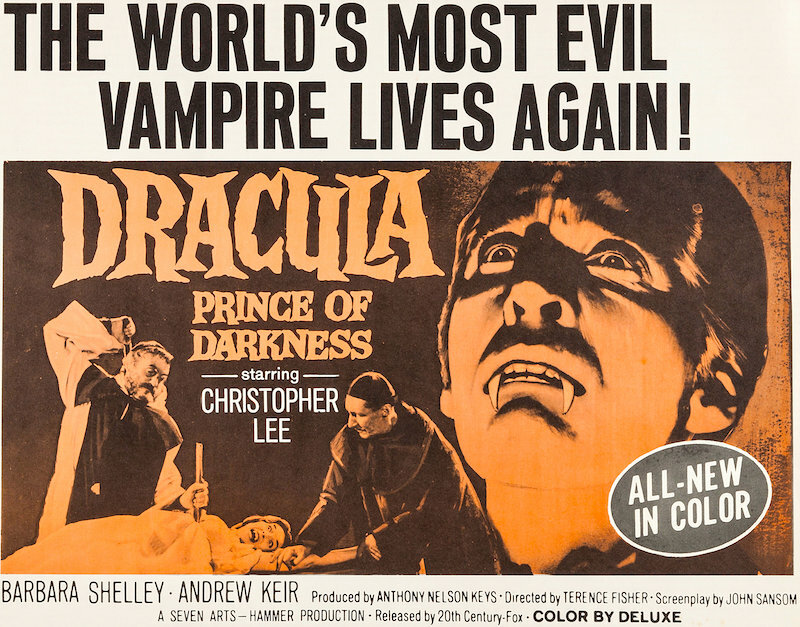 It would be eight years before Lee donned the cape, fangs and bloodshot contacts for Dracula – Prince Of Darkness (1966). Whether it was worth the wait is something Hammer fans tend to debate quite a bit. 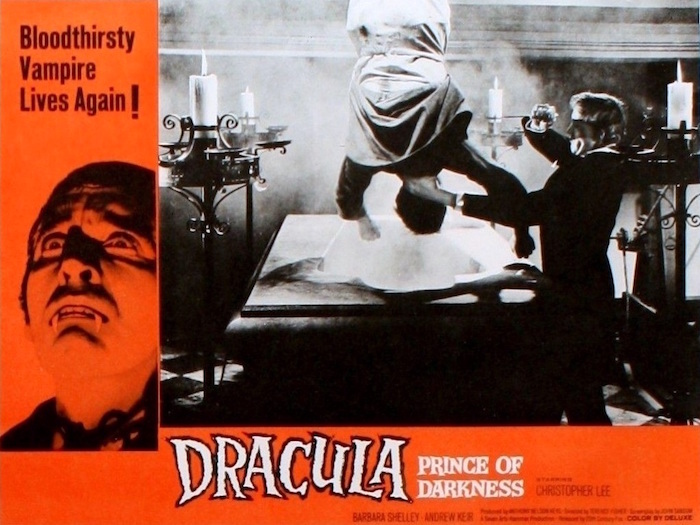 Dracula – Prince Of Darkness was one of the first Hammer films I saw (it might’ve been the first), and it made a huge impression on me, particularly the resurrection sequence. The movie’s deliberate pacing and grim tone seems to explode once Klove gets out his knife. And as a kid, that scene pulled the cinematic rug out from under me — after that, anything could happen — and I watched the rest of the film with an odd combination of joy, distrust and absolute dread. Bringing Lee back in Prince Of Darkness sent the series down a path of killing Dracula off in one picture, then bringing him back in the next. But they never got it better than this one. With Van Helsing (and Peter Cushing) missing, we get the vampire hunter Father Sandor (Andrew Keir). 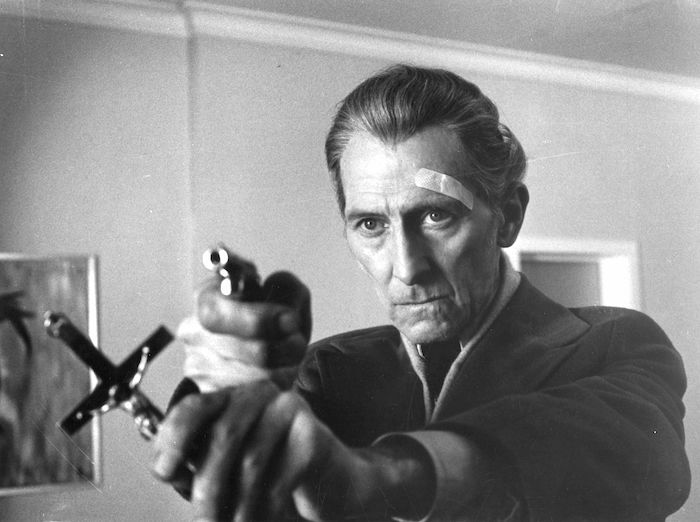 He’s terrific, but Cushing is missed — his mixture of obsession and morality makes a good backbone for a picture like this. One of Dracula’s victims is Barbara Shelley, whose performance — going from repressed rich lady to sexed-up vampiress — is really something. Dracula was a model of efficiency — it looks like it cost much more than it did, its pacing is perfectly tight, and it works wonders with a very small cast. 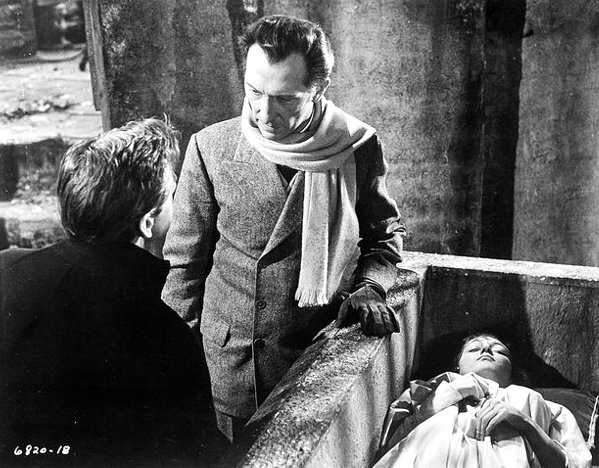 For Dracula – Prince Of Darkness, Terence Fisher and his team spread things out a bit in terms of both pace and space — this is one of the few Hammer horror films in ‘Scope, Techniscope, to be exact. That Techniscope is one of the things that makes the new Blu-Ray from Scream Factory so important. Techniscope used far less frame space than an anamorphic process like CinemaScope or Panavision, so sharpness and graininess become an issue. But they’re not a problem here, and we get two different versions of the picture to choose from. The British cut is a bit shorter, and its color leans toward green — but it’s sharper. The US version is longer by about 12 seconds, its color is much better, but it’s a bit softer and the blacks are very dense. Of course, Hammer horror films are all about their color. Scream Factory was wise to give it to us this way. Combining the two wouldn’t have worked (the mismatched color would have driven us all nuts), and there would’ve been complaints about one vs. the other. (Personally, I prefer the US version.) The sound is terrific, giving James Bernard’s score the power it deserves. There’s a coffin-full or great extras, from a short documentary to some behind the scenes home movie footage. All in all, this is an outstanding package — and a terrific opportunity to rediscover a film that has spent way too much time under the shadow of its predecessor. It’s time for its own resurrection. Highly, highly recommended. 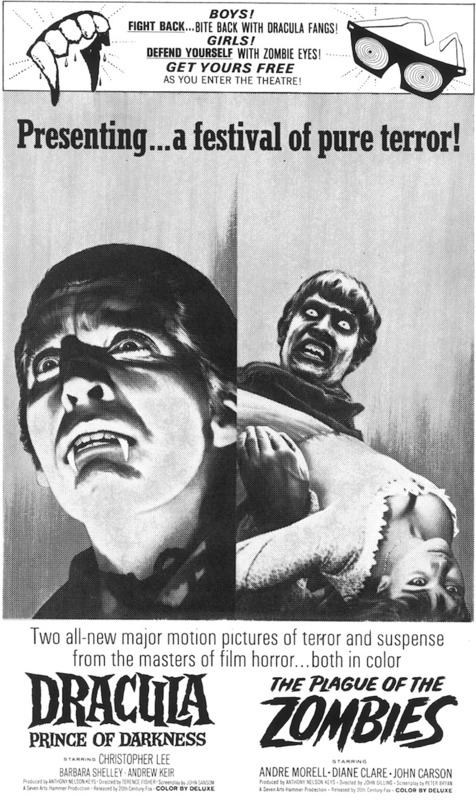 Dracula – Prince Of Darkness played theaters paired with John Dilling’s The Plague Of The Zombies (1966), a smaller picture that’s a real knockout. It’s available from Scream Factory, too, and it’s essential. 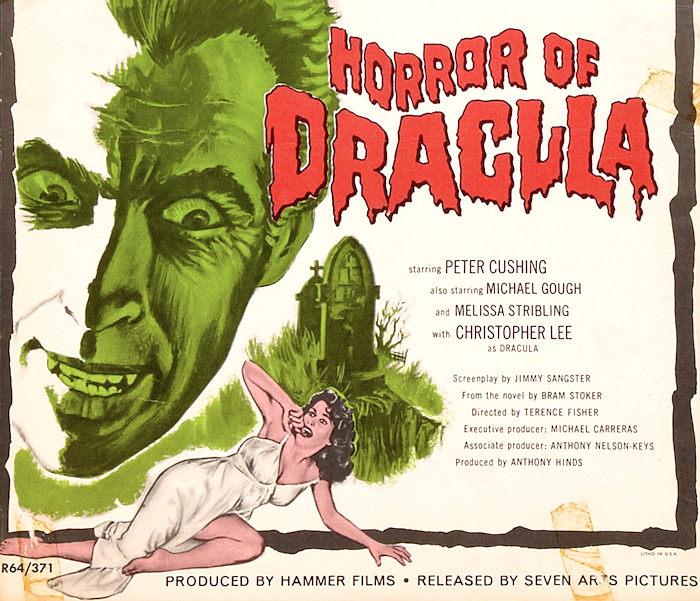 Blu-Ray Review: (Horror Of) Dracula (1958). In the early 90s, I had the chance to see a 35mm IB Technicolor print of Horror Of Dracula (1958) run at a film festival in Baltimore. 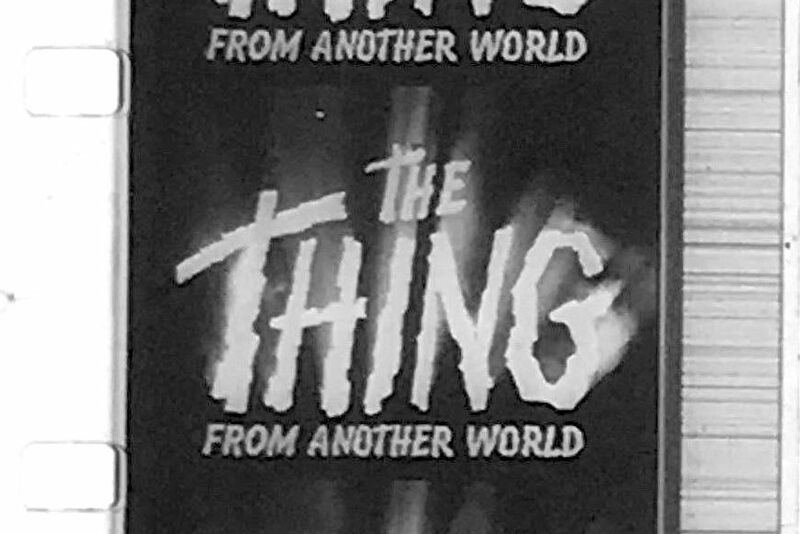 It was a great evening — one of my favorite nights spent in a movie theater, with a film I’d seen countless times taking on a whole new life. Technicolor let the fake blood (and Jack Asher’s color effects) really pop, and the stories of Hammer’s visceral late-50s impact suddenly made a lot of sense. The new Blu-Ray from Warner Archive gives us a near-perfect approximation of what that IB Tech print looked like. To back up a bit, Hammer Films breathed new life into the Horror Movie with their violent, colorful takes on the monster classics. 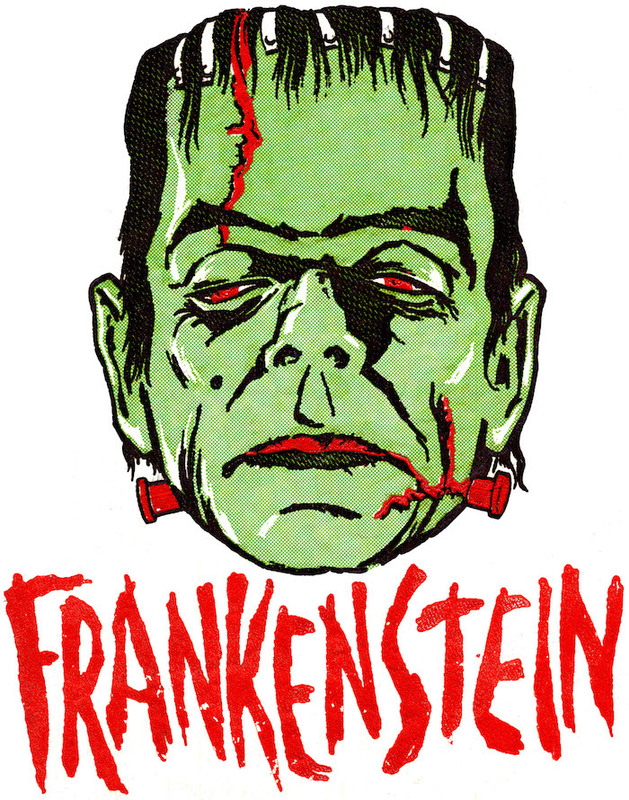 They began with Curse Of Frankenstein (1957), which was a huge hit. 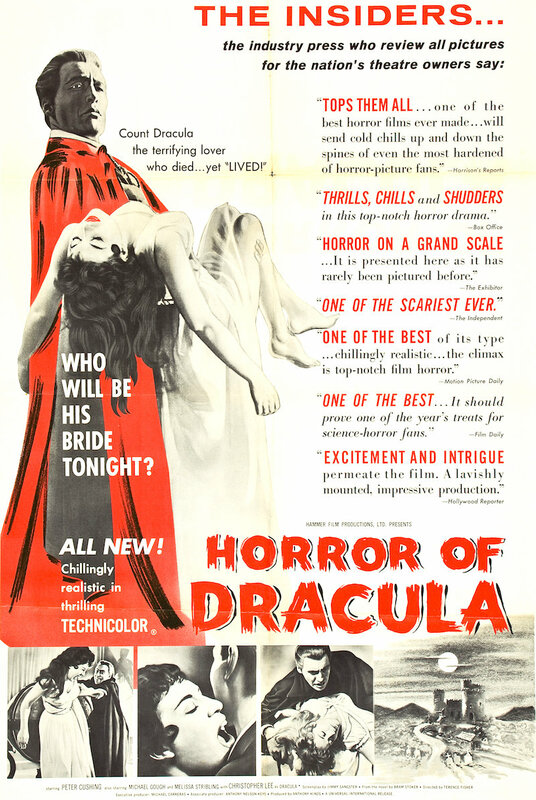 Next came Dracula (1958, Horror Of Dracula in the US), followed by The Mummy (1959). 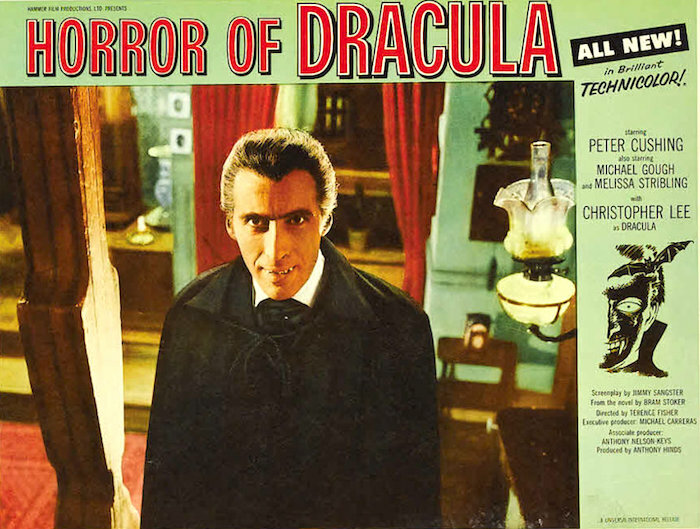 All three starred Peter Cushing and Christopher Lee, were shot by Jack Asher and were directed by Terence Fisher. As the censors lightened up some and the ratings system came along, Hammer lost their way a bit. But along the way, they made some really cool movies — and had a huge, lasting influence on the Horror Film. Dracula might be the best of the bunch. It’s a streamlined, yet faithful adaptation of Bram Stoker’s novel, with an emphasis on the sensual side of the vampire thing that hadn’t made its way to the screen before. Lee is suave as the evil Count, whose female victims don’t seem all that much like victims. Peter Cushing is perfect as the moral, determined vampire killer Dr. Van Helsing — whose calling has relegated him to a life on the fringes of both Science and Religion. Each time I see Dracula, I’m struck now by how well it moves. There’s not an ounce of fat on this film. It’s made up of set-pieces — a biting here, a staking there — that build to a final battle of Good vs. Evil. It feels, to me, like it’s about 20 minutes long. Terence Fisher might be the Ringo Starr of film directors — subtle, nothing flashy, but with impeccable taste and a perfect sense of what is needed. He knows exactly where to put his camera, and no matter how lustful or blood-soaked things get, there’s a class to his Hammers that really sets them apart. This one is the perfect showcase for his talents. Ladies and gentlemen, meet Mr. Jack Asher, BSC. Over the years, we’ve been unable to really appreciate Jack Asher’s brilliant photography, due to faded TV prints, crappy VHS tapes and a pretty lazy attempt at a DVD. (The UK Blu-Ray release looked quite good.) Asher tosses an oddball colored light here and there, and his choices are theatrical, effective and just plain cool. These touches were perfect for Technicolor, and they’re perfectly presented by Warner Archive. So is the audio, with James Bernard’s score pounding out of your speakers with astounding impact. This is one of the finest Blu-Rays in my collection, and I’m seriously considering a bigger, better TV just to give it a closer look. Essential. Next up: Dracula – Prince Of Darkness (1966) from Scream Factory! 2018 In Review – Part 2. When I started doing DVD and Blu-Ray commentaries, it no longer felt appropriate to survey the best DVD and Blu-Ray releases of the year. So, as a substitute (maybe a poor one), here’s a reminder of a few things we were treated to this year. We’ll let all the praise, complaints or ranking come from you in the comments. Part 1 can be found over at 50 Westerns From The 50s. This was a banner year for old sci-fi and horror movies making their way to Blu-Ray. From what we’re hearing so far, next year might be the same for noir and crime pictures. Anyway, here’s some of 2018’s bounty — a few of which I’m still working on proper reviews of. This is one of the all-time favorite movies. I find something new in it every time I see it — a line, a look, a particular setup, the music, a new appreciation for the guy who did the fire stunt. It’s always something — and that, to me, is one of the requirements for a Great Movie. Warner Archive worked long and hard on this one, and I’m in their debt for sure. It’s like there was some sorta Monster Movie Summit, and it was decreed that the Hammer Dracula series would be given its due on Blu-Ray. Warner Archive did a lot of the heavy lifting with Horror Of Dracula (1958), Dracula A.D. 1972 (1972) and The Satanic Rites Of Dracula (1974). In the meantime, Scream Factory came through with Dracula – Prince Of Darkness (1966). Taste The Blood Of Dracula (1970) hit Blu-Ray a few years ago. 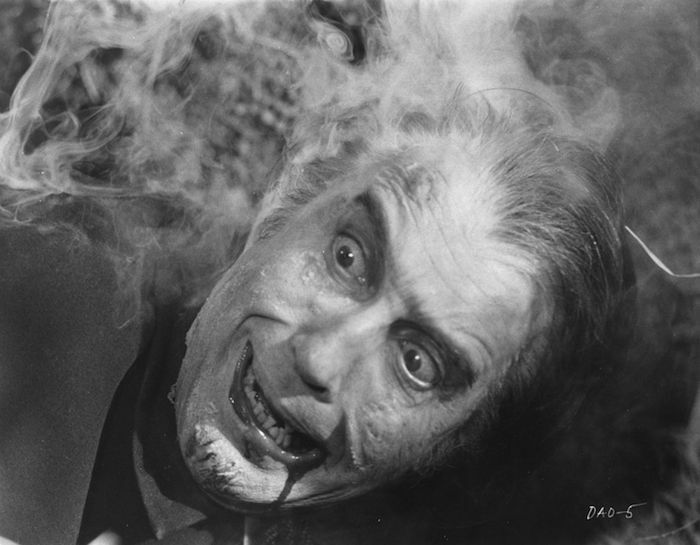 That leaves Scars Of Dracula (197) as the only Hammer Dracula picture not available on Blu-Ray. Who’s gonna step up to the plate for that one? The Hammer goodness wasn’t limited to the Dracula pictures. 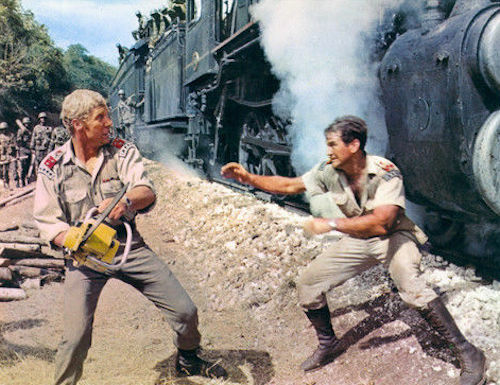 Mill Creek included some Hammer pictures in their twin-bill sets, some of the best values in all of home video. 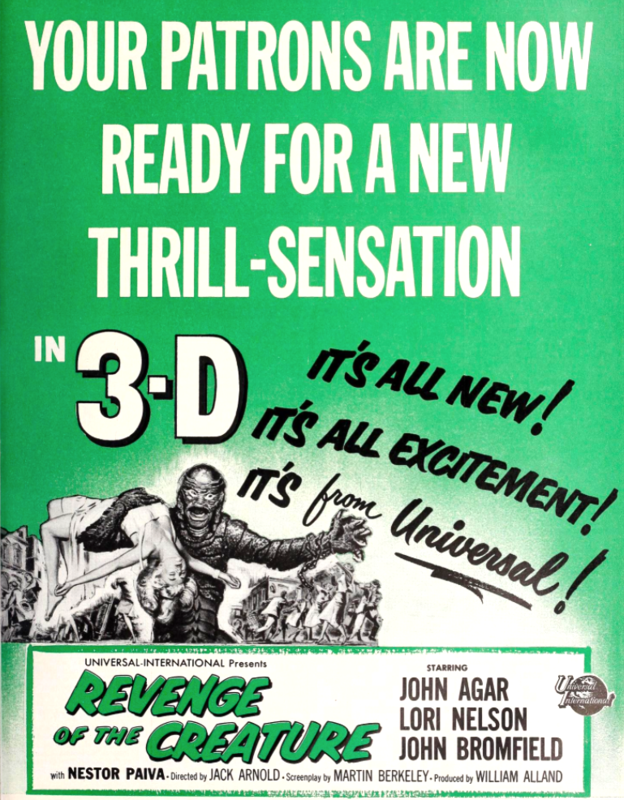 Hammer Films, William Castle, Ray Harryhausen — there’s some good stuff in those sets. That’s quite a name for a set that only includes three movies. But what movies they are — the first two, anyway. And they’re in both widescreen 2-D and 3-D.
Joseph H. Lewis hit it out of the park with Gun Crazy (1949). So did his cast — and this year, with a stunning Blu-Ray, so did Warner Archive. Don Siegel making it to Blu-Ray is always a reason to celebrate, and this is one of his many milestones. Over the years, we’ve all put up with some pretty shoddy-looking stuff when it comes to this incredible movie. Olive Films’ Blu-Ray is a huge improvement. 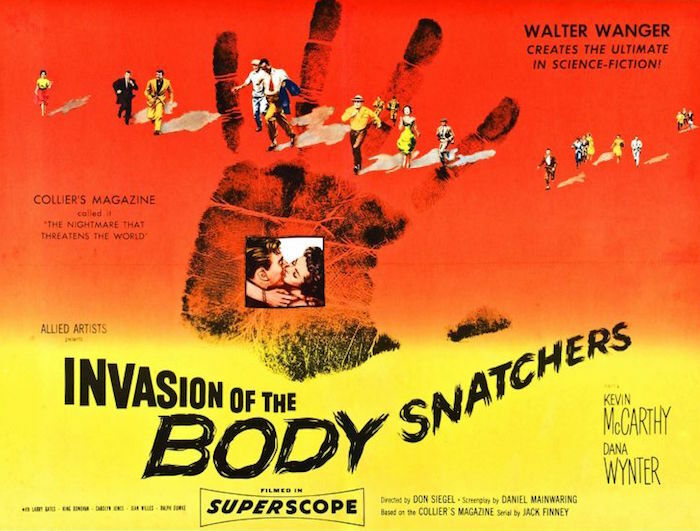 It’s hard to pick between this one and House On Haunted Hill (1958) for my favorite William Castle movie. Scream Factory did a wonderful job with this one, and they’ve given us other Castle pictures as well. Warner Archive has been hinting around about this one on Blu-Ray for a while. It’s beautiful — and still one of the damnedest movies I’ve ever seen. There’s a few that stood out for me. What DVD and Blu-Ray releases knocked you out this year? Blu-Ray News #203: Horror Of Dracula (1958). Warner Archive is giving us all a terrific surprise for the holidays — bringing Hammer’s Horror Of Dracula (1958) to Blu-Ray. It’s the first of their Dracula series and certainly the best. Today, it’s hard to understand the impact these films had upon release — luckily they still hold up as great movies. I saw a 35mm Technicolor print of this about 20 years ago and can still remember how gorgeous it looked. As soon as those red titles came up, we knew we were in for a real treat. The UK Blu-Ray is terrific, and this should be just as good, if not better. Essential — especially since most of the series has recently been resurrected in HD, too. Blu-Ray News #195: Three Hammer Dracula Pictures Coming To HD. 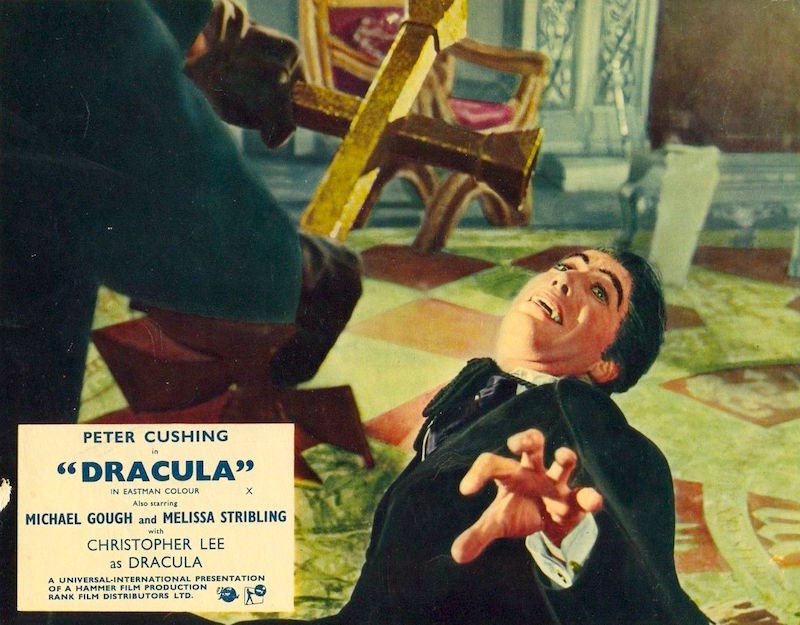 With three of the Hammer Dracula pictures on the way on Blu-Ray, the Count’s about to put a real bite on our finances. Oh well. 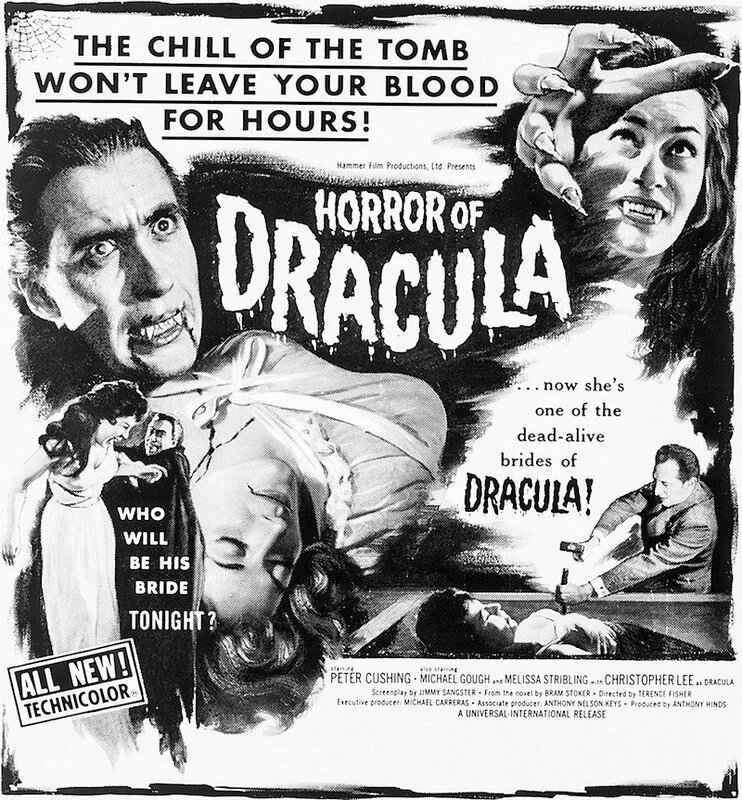 It took Hammer almost 10 years to do a sequel to their Horror Of Dracula (1958). They did it in Techniscope, which is really cool — one of the few Scope horror films Hammer did. 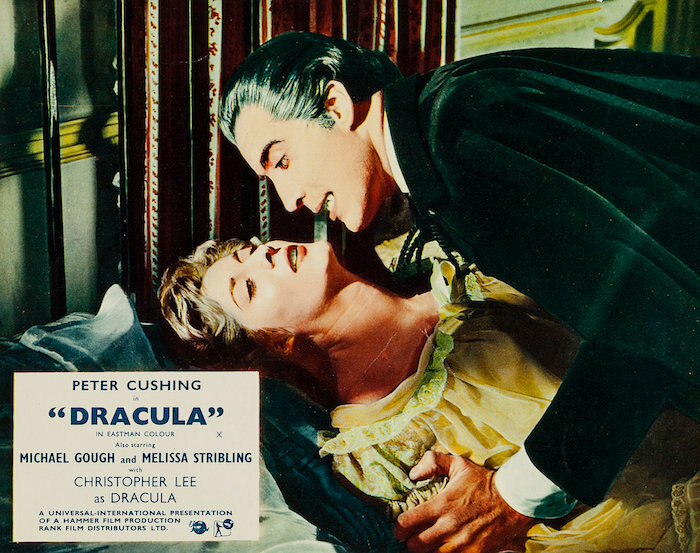 Barbara Shelley’s terrific, but Peter Cushing is missed as Van Helsing. Both Lee’s resurrection and demise are really effective — this one really knocked me out as a kid. Coming to Blu-Ray soon from Scream Factory. 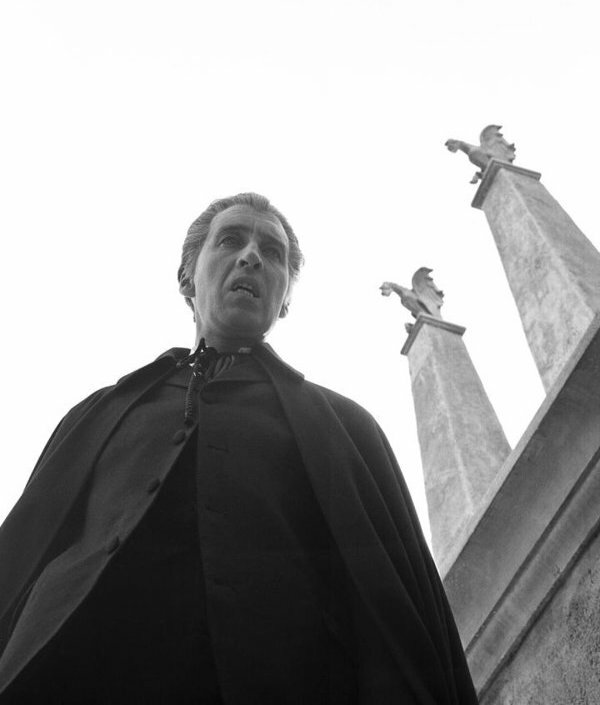 Bringing Dracula into the 70s turned out to be a better idea than a movie (probably inspired by AIP’s Count Yorga, Vampire), but Dracula A.D. 72 (1972) has plenty to recommend it. Cushing’s back, which helps a lot. Caroline Munro makes her first Hammer appearance (of two). And the period opening is terrific. I can do without Stoneground, who replaced The Faces (that would’ve been cool). Coming to Blu-Ray from Warner Archive. By the time Hammer got around to The Satanic Rites Of Dracula (1973), things were getting pretty tired. Way too much times is devoted to some stuff about the plague, but when Lee and Cushing duke it out, it’s glorious. At one point, this was distributed in the States by some cheeseball company as Count Dracula And His Vampire Bride. Coming to Blu-Ray from Warner Archive. Blu-Ray News #183: Dracula – Prince Of Darkness (1966). 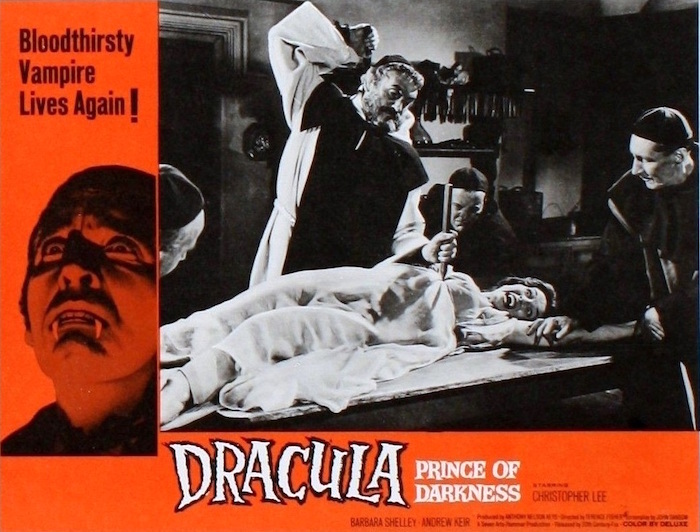 Dracula – Prince Of Darkness (1966), Hammer’s sequel to Horror Of Dracula (1958, called just Dracula in the UK), is coming to Blu-Ray from Scream Factory. It’s the only Hammer Dracula picture in Scope (Techniscope), and it should be a real treat in high definition. Plus, you can always count on Scream Factory for some great extras. This was the first of these movies I saw as a kid. From bringing Lee back to life in the first reel to killing him off again at the end, I was completely mesmerized by the whole thing. With this, The Vampire (1957), The Tingler (1959) and The Legend Of Hell House (1973), Scream Factory is bringing some of my favorites — the junk that really rotted by brain as a kid — to Blu-Ray in terrific shape. I’m eternally grateful. Dracula crawls out of the grave this December.